Who doesn’t like fried dough? Certainly no Neapolitan I know. Neapolitan cookery is replete with all sorts of frittelle, or fritters, made from dough. World-renowned zeppole are a favorite treat at street fairs, and for good reason. And the lesser known fried pizzelle fritte and calzoncini are just as delicious. Today we’ll look at a particular fritter that might well be my personal favorite: frittelle di pasta cresciuta. (Pasta cresciuta simply means “grown” or risen dough.) What sets these frittelle apart is their especially soft and sticky dough, well-nigh impossible to work with your hands. After the dough has risen, it forms a gooey paste that you need to scoop up with a spoon. But once fried, the dough’s high water content gives the resulting fritter a fluffiness and, I find, richer flavor than any other fritter. Pasta cresciuta is delicious all by itself, but you can add various “fillings” like today’s shredded zuccchini, which are actually folded into the dough rather than wrapped in it. Fresh from the fryer, these little guys are truly addictive as an afternoon snack or to nibble on as you sip your before dinner Spritz or other cocktail. In a mixing bowl, mix the flour with the yeast and a generous pinch of salt. Then add the water and mix until you have a very soft and sticky dough. Cover the let the dough rise for a good 2 or 3 hours, or more if convenient. When the dough has risen, it should have formed bubbles. It will also be quite gooey. While the dough is rising, trim off the bottoms and tops of the zucchini, then shred them using the largest holes of a cheese grater. Place the shredded zucchini in a colander and sprinkle with salt. Let the zucchini rest. When you’re ready to fry, take the shredded zucchini in handfuls and squeeze them of their liquid. Pat the zucchini dry and add the shreds to the mixing bowl with the dough. Fold the zucchini into the dough with a spatula or your hands. Deep fry the pasta cresciuta fritters until they are cooked through and lightly browned. Drain on a baking rack or paper towels and serve while they’re still hot. To my mind, the best flour for making pasta cresciuta is the “OO” variety, the kind often used for pizza and fresh pasta. Made from finely ground soft wheat, it produces a fluffy, delicate fritter. In the US, imported “OO” flour can be found in Italian food shops and online as well. The King Arthur company reportedly makes a kind of “OO” flour they market as “Italian Style Flour“. [Disclaimer: I haven’t tried it so I can’t vouch for the results.] But if you don’t have ready access to these flours, no worries. Good old all purpose flour will do you just fine. For best results, you’ll need to fry pasta cresciuta at the right temperature. I’ve noticed that many English-language recipes call for frying dough at 375F, but I’ve found this is too hot for pasta cresciuta, producing a crust that darkens too quickly, and the flecks of zucchini tend to burn. Frying at too low a temperature, on the other hand, produces a greasy result. In my experience, the 180C/350F indicated here is just right. As always, don’t crowd the pan too much, or you will wind up with soggy, greasy fritters. Frittelle di pasta cresciuta like most fried foods are at their best when eaten straight out of the fryer. As the Neapolitans say “frijenno e magnanno“, fry and eat! (Well, don’t take this too literally—give them a few moments to cool off slightly so you don’t scald your mouth on hot oil…) But in a pinch, you can re-heat these fritters in the oven. I find that a few minutes at 95C/200F on a convection—or even better “air fry”—setting works nicely to bring them back to life. As mentioned, pasta cresciuta can be the vehicle for a vast variety of fillings. As mentioned, they’re really more flavorings than fillings, since the ingredient is generally folded into the gooey dough. But if you prefer a true filling, you can try to fold the dough over the filling using two spoons, as recommended by Jeanne Caròla Francesconi. I like zucchini blossoms in my pasta cresciuta even better than the vegetable itself, but alas it’s been years since I’ve been able to source any in my area. Anchovy is perhaps the most classic choice, and pairs marvelously well with the zucchini blossoms. . Poached baccalà flaked and then folded into the dough is another delectable seafood filling. If you want to stay vegetarian, cubes of provolone or another semi-hard cheese would be lovely as well. Heading in a carnivorous direction, small bits of prosciutto, salami or other salumi (cured meats) are yummy, too. And if you like, add some spice with a pinch of red pepper flakes or fennel seeds, either on their own or paired with any of these other ingredients. When you're ready to fry, take the shredded zucchini in handfuls and squeeze them of their liquid. Pat the zucchini dry and add the shreds to the mixing bowl with the dough. Fold the zucchini into the dough with a spatula or your hands. Deep fry the pasta cresciuta fritters until they are cooked through and lightly browned. Drain on a baking rack or paper towels and serve while they're still hot. I made these tasty treats in a gluten free recipe and they were amazing! They retained their soft, pillowy texture! These with a chilled glass of Falinghina, heaven…. Best street food, right? 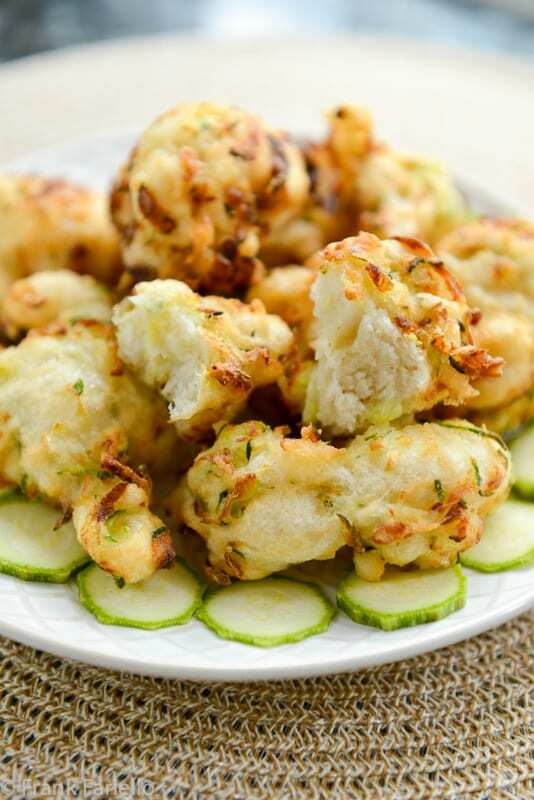 When my mother fried, she basically locked herself into the kitchen to prevent us, mostly my father to eat things just off the pan: cauliflower, zucchini, zucchini blossoms, etc. I have never tried making pasta cresciuta: it looks like a lot of fun. Hi Frank, I made these yesterday and they were delicious! I yielded about 41 of these delicious morsels. I added (after the first taste-test) one thinly sliced shallot because my zucchini was quite flavourless, I suspect zucchini in Italy packs more punch. Our Italian guest loved them! Thanks for the recipe, it’s a keeper! Those look downright addictive, Frank. I love your idea of adding the zucchini too, but I agree with you, if I had some zucchini blossoms, all the better. One of these days I’m going to find a reliable source for them, fingers crossed! non conoscevo questa ricetta, mi attraggono i cibi salati, la segno subito, grazie per averla condivisa ! E grazie a te per il commento, Chiara! Nice to know, Dave. Those zucchini plants really are profilic, aren’t they? Yet another recipe I’ve never seen or heard of, Frank! I would LOVE these, but then again, who wouldn’t? 🙂 Forwarded to my Mum! Hope you both enjoy them. Cheers to your Mum! I am not a huge fan of deep fried foods but your recipe does make me curious. A dough with yeast for a fritter sounds wonderfully fluffy and chewy. Would you serve this dish with a sauce? It looks like the perfect dish for a summer dinner party. We are having our Italian neighbour for dinner on Thursday, I will make these for sure! Thanks Frank. They’re generally eaten on their own. Plenty savory without a sauce, but I see no reason why you couldn’t have one on the side if you wanted. An aïoli comes to mind as a nice accompaniment. Oooo…. this looks like a fun way to use up some zucchini. We are getting to that time of year where we are FLUSH with the stuff and I am trying to find new ways to use it. When it rains, it pours. This is all a good problem to have. I’ve been there, too, Ben in summers past. I went so overboard the first time I planted zucchini there was no way to consume all the zucchini, even with little “tricks” like this one. Had to give it away at work! Frank – I can’t wait to try these. Mark (at my insistence) has bought me a magnetic induction burner for my upcoming 60th – I can’t wait to use it for frying beautiful things like these fritters. (I’m not allowed to fry inside, thus the burner to do it outside.) Will keep you posted! Tried last night. very good. I used 10% whole meal flour and instead of grated zucchini I used anchovies, as u say in the notes. This is the way we used to have in my family for Xmss Eve and the Calabria side of my family would call them zeppole. Very moorish, with a cold beer. Glad you like them, Stefano! I love these with anchovies, too. May well be my favorite, as I do love my anchovies. Who doesn’t like fried dough? Certainly not me. I am eating these as I am typing. Loved this recipe. Fried Bread and Zucchini just can’t be wrong. Husband loved these too. Thank you for sharing this recipe!!! And thanks for your comment, Lucia. So glad you guys enjoyed them! Made this last night, halved the recipe and it was so delicious! and EASY! I love your site and admire the great deal of research you do and historical knowledge that you impart! Must confess: completely forgotten these beauties and I thank you very much for reminding me how beautiful this dish is ! Enjoy the week end ! Frank, as my zucchini plants are currently at peak production, your timing is perfect. Your Pasta cresciuta con zucchine is a much lighter sounding fritter than I’ve made in the past, which is good. Is it customary to eat these with a dipping sauce? FYI, when we lived in the states we used KA Italian style flour with great success. But, imported Italian “00”, was the best. I’ve never had them with a dipping sauce myself as I find them plenty tasty without, but there’s nothing to stop you, of course. Personally I’d opt for an aoili or some other mayo-based sauce, but whatever suits your fancy. Who doesn’t like fried dough? I don’t think there’s a culture that doesn’t have some variation of it. Love the zucchini filing, and appreciate the ideas for alternate fillings. Anchovies? Salami? Gotta try! Excellent recipe — thanks. Che bontà ! scrumptuous ! I just wanted to tell you I just LOVE your recipes. I lived in Rome for many years and married an Italian and was exposed to Mediterranean Diet before it became as popular and healthy as it is today. I find your recipes have a special ‘touch’, obviously you learnt a lot from your grandmother. Recently I followed your recipe for the tomato salad and it was a huge hit, thanks look forward to following in your culinary footsteps!!! !